Magento is a leading e-commerce solution with a superior range of features. If you're looking to expand on your current online sales or want to start with the premium e-commerce solution then Magneto is your ideal choice. Used by large companies and well known brands, Magneto comes crammed with features for increasing sales and managing customers. At Terranova we can design and implement a Magento CE e-commerce solution to suit your requirements. We can also train your team in the use of Magneto at your premises so that when we've finished our work, you'll have a great e-commerce solution to sell your products and the knowledge to use it to it's full potential. Ability to run multiple shops from the same admin area (these can be on the same or different domains). A simplified user checkout increases conversions. Layered navigation helps customers find what they are looking for easily. The advanced use of attributes and a tabbed product detail page allows shop owners to enter complicated product information easily and display it in an attractive way to customers. 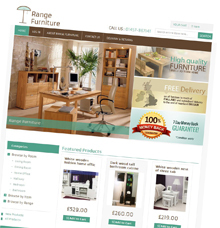 Allows you to easily set up customisable products. Easily generate and use discount coupons for promotions. Easily set up gift products with gifting options. The features listed above any many more come included in the standard Magento CE solution. In addition there is a large marketplace of free and paid-for extensions that allow you to enhance your store. Our standard Magento CE set-ups, including graphic design, adding 50 products and training you in how to use it, start from £2,200. For more complicated set-ups, for example if you have a large database of products and customers from an existing e-commerce site that you would like to import into Magento get in touch with us for a quote. We are also happy to hear from you if you would like someone to carry out maintenance on or update an existing Magento e-commerce store.